So I’m teaching a new course next fall, and I’m thinking about what books I should put on the syllabus. I would prefer to think about this sort of thing during the summer, but my school requires that we submit our book orders sometime around March or April, so I don’t have that luxury. The course needs to do a number of things: it’s a “Great Books” course, so we are supposed to cover canonical works, mostly, although there is some room for other things as well. It’s also interdisciplinary. While my instinct would be to assign all literature, we are supposed to cover at least two or three different disciplines. Finally, each instructor picks a theme for the course, which is supposed to be phrased as a Socratic question, such as “What is justice?” This theme will organize the readings/assignments/discussions for the whole semester. Jamaica Kincaid’s Lucy (for something a little lighter and contemporary). 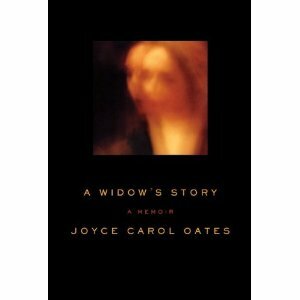 Joyce Carol Oates’s memoir A Widow’s Story is a harrowing, powerful read. I had trouble putting it down, even though it was thoroughly wrenching. I started reading it on my iPhone (my copy courtesy of the publisher) and only after I’d been reading awhile did I figure out that it’s over 400 pages long; it turned out to be a very quick 400 pages, but still, I wondered how she would keep it up for that long. How could she write with such detail, such honesty, such emotion, how could she keep up that level of intensity and make the book readable at that length? The book tells the story of the death of Oates’s husband, Raymond Smith, in February, 2008. It was a fairly quick final illness and death; he was fine one day, and the next in the hospital suffering from pneumonia. He died a few days later from an infection. Oates tells the story of the days in the hospital and then the days, weeks, and months afterward as she tries to survive and make sense of what happened. She is thoroughly distraught, full of anger and guilt, and she collects sleeping pills in case she decides to commit suicide. The thought of suicide is a comfort, an escape available if she needs it. She has friends who take care of her and help her through all the tasks a widow faces (the funeral, the will, etc. ), but she feels only a shell of the person she once was. Her world is an entirely new, unrecognizable, horrible place. She writes about all this in great detail, describing her thoughts and emotions each step of the way. It should get dull, but it doesn’t: there’s something riveting about her voice that kept me almost spellbound. There is a lot of repetition, which also should get dull, but doesn’t; she faces the same problems again and again — not wanting to be out with people but when she’s home alone not wanting to be there either, getting angry when people say insensitive things, feeling guilty for surviving her husband, thinking about and counting her sleeping pills — and each time it’s a fresh emotional hit, and I felt like I was right there with her. Those days! — nights! — a Mobius strip continuously winding, unwinding. This nightmare week of my life — and yet— during this week Ray is still alive. Something of the derangement of Widowhood is beginning here. For in dreams our future selves are being prepared. In denial that her husband is seriously ill the Widow-to-Be will not, when she returns home that evening, research E. coli on the Internet. Not for nearly eighteenth months after her husband’s death will she look up this common bacterial strain to discover the blunt statement she’d instinctively feared at the time and could not have risked discovering: pneumonia due to Escherichia coli has a reported mortality rate of up to 70 percent. She also explains things that don’t really need to be explained, for example, describing Catholic theology and giving us a history of lobotomies, things that relate to the story she is telling, but don’t need to be dwelt on in the way she does. It feels, though, as if Oates no longer understands the world around her and needs to explain it to herself. She needs to tell herself the story of her life and her husband’s life and all the details that went into them, and she needs to recount to herself what she, “the widow,” is experiencing, in order to try to grasp it. Though I am writing this memoir to see what can be made of the phenomenon of “grief” in the most exactly minute of ways, I am no longer convinced that there is any inherent value in grief; or, if there is, if wisdom springs from the experience of terrible loss, it’s a wisdom one might do without. That’s all we get about her purpose and motivations. I generally like to have more self-consciousness from memoir writers, more discussion of the purpose and meaning of the writing (although I may be in the minority on this — most memoir writers that I know of don’t do it), but in this case, the reticence works. Throughout the whole book Oates seems to be a mystery to herself; she no longer recognizes herself in her new role as widow, so how can she analyze her motivations? The most she can do is describe what is happening, moment by moment. Becky mentioned a while back that she enjoyed Molly Fox’s Birthday by Dierdre Madden, so I picked it up from the library and gave it a try myself and found that I enjoyed it very much too. The novel has a structure that I like: it takes place over the course of one day, with frequent jumps back in time to describe scenes from the past. The title character, Molly Fox, doesn’t appear at all, except in a phone conversation. Instead, the novel is narrated by her friend, an unnamed woman who is a playwright. Molly is an actress, and the two met while preparing to stage a production of the narrator’s first play with Molly in the starring role. It’s a play that will make both their reputations and send them off into successful careers. But all that happens far back in the novel’s past; in the present tense, the two women are a older (it’s Molly’s 40th birthday, or at least we presume so; she is secretive about her age, as she believes actresses need to be). The narrator is living temporarily in Molly’s house in Dublin while Molly is traveling, and she is trying to write her next play. Over the course of the day, she struggles with her writing, takes a walk into town, and unexpectedly meets an old friend for dinner. It seems like a quiet day on the outside, but all the drama is of the interior sort: the narrator spends her day thinking about her art and her friendships and also about how she and others have been shaped by their pasts. The third main character is Andrew, the unexpected dinner guest, and a man the narrator has known since their university days when they used to take study breaks together. Andrew and Molly both have difficult relationships with their families. Andrew is passionately devoted to the arts but comes from a family indifferent to them, and his brother died a violent death at a young age. Molly’s mother abandoned her while Molly was still a child, and her brother has struggled with severe depression his entire life. As the narrator tells these stories and thinks about her two friends, she wonders just how well she really knows them. Both of them can be secretive and reserved, but this doesn’t diminish her love or her sense of closeness to them. The book is very much about the mystery of friendship, how experience can bring people together in deeply loyal relationships, even when there is much about each other they don’t know, and also how friendships can arise unexpectedly. When Molly develops a close friendship with the narrator’s brother, Tom, the narrator has to reevaluate her understanding of both of them, as well as deal with feelings of jealousy. The novel is also about art, its mystery and its transformative capability. The narrator spends a lot of time thinking about Molly’s acting; she is shy in regular life, but on stage, she becomes a different person entirely. There is something about the artificial quality of the theater that allows her to capture the feeling of reality, and something about the fleetingness of a play that makes seeing her act a particularly intense experience. And then there’s Andrew, whose entire life is shaped by art; he is an art historian who has begun to host successful television programs where he explains the meaning of art to his audience. There is something about his personality that works well in this medium; he is able to communicate a genuine passion for his subject. To the narrator, Andrew is all about artifice — he doesn’t seem to care about nature at all, and would prefer to look at paintings of a landscape than the landscape itself. But the “artificial” world of art is his world, and he lives comfortably in it. It’s sometimes unclear, the book argues, what is artifice and what’s real, but somehow they are inextricably combined. This is, obviously, a thoughtful book, slow-paced but absorbing. If you like thinking about relationships and about the meaning of art, and if you like following the train of someone else’s thoughts as they try to sum up a life, then I think you will enjoy this book. and congrats to Stefanie for winning Parrot and Olivier in America! If you two would send me your addresses (to ofbooksandbikes at yahoo dot com), I’ll have the books sent to you soon. Thanks to everyone for participating; I wish I could send you all a book! I’ve been thinking lately about all the ways there are these days to get books, and I was surprised at how long my list was. No wonder my TBR piles are growing. Bookstores, including new and used. I have two used bookstores within a half mile of my house, and dozens more if I’m willing to drive a bit. There are new bookstores within, say a 20-minute drive, and tons more if I’m willing to drive further. If I drive an hour, I can get to New Haven, which has great stores, and if I drive 1.5-2 hours, I can get to Manhattan, with all the books I could want. Libraries, including my public library which is less than a mile from my house, and my school library. Hobgoblin’s school library too, for that matter. Oh, and from just about any library through inter-library loan. Library book sales. There are tons of these around here. In fact, there was one going on last weekend, but we wisely stayed away. I suppose you can get books at garage sales/tag sales too, although I never go to those these days. Online book stores. There’s Amazon, of course, but I try to buy from smaller sites like Powell’s or The Book Depository. There’s Better World Books, and tons of others. There’s eBay, too, right? E-books, from online sellers, from sites like Project Gutenberg that offer free classics, or free from the library (for me, both the public library and my school library). Audio books, again, from bookstores, for free online, or from the library (on CD or downloaded). Book-swapping sites like Book Mooch or Paperback Swap. I’ve gotten 136 books from Book Mooch, and I’ve given away 92. I’d say I came out ahead there! ARCs from publishers. Not everyone gets these, of course, but I think, generally, if you blog about books regularly for a while, publishers will start to contact you, even if your blog is small, like mine. It’s now possible to get ARCs digitally through NetGalleys. Free books from sites like Goodreads and LibraryThing. I just won Carlos Fuentes’s new novel from Goodreads, and I know quite a few people who have gotten books from LibraryThing’s Early Reviewer’s program. I’m just starting to try to my luck with them. Gifts. It’s a tradition around here, and probably for lots of you too, to give books on major holidays. Borrowing. I only borrow from others occasionally because I have so many of my own books to read, but I’m always happy to borrow something good from a friend, and I love it when friends borrow my books. I just lent a friend from work my copy of Infinite Jest, and I can’t wait to hear what she thinks of it. Blog giveaways. I’ve won quite a lot of books from my fabulous blogger friends. Thank you! It’s been a while since I finished Bohumil Hrabal’s novel Too Loud a Solitude, but I want to write something about it because it was such an odd, wonderful little book (98 pages). It took me a while to warm up to it, actually; I wasn’t in the mood for something as spare and quirky as this book is, but it ended up winning me over. It’s about a man, Hanta, who lives in Prague and works as a trash compactor, specifically a wastepaper compactor, and he rescues books from the trash to take home and read. He has towering stacks of books at home, and he sleeps in fear that they will fall and crush him. His education has been reading these books, and what an education it’s been: he finds all kinds of wonderful things, books by Seneca, Kant, Erasmus, Goethe, and Nietzsche, reproductions of Van Gogh and Gauguin paintings, and lots of other treasures. Hanta is a quiet and isolated man; most of his time is spent at work, and he works overtime in order to make up for his slowness: he doesn’t hurry through his job, but instead takes his time to appreciate the books that come his way. He’s so absorbed in his work, in fact, that he dreams about retiring only to buy a paper crusher so he can do his work at home. He occasionally wanders the streets of Prague and he sometimes gets visitors, most often his boss who is forever furious at him for not working fast enough, but most of his time he spends in the dim, enclosed setting cooped up with his machine. Early on in his career, he would get upset when people threw away good books and was particularly furious over the destruction of the Royal Prussian Library after World War II, but as time goes on, he becomes resigned, or perhaps numb, to the destruction, and just does what he can to save as many books as possible. For thirty-five years now I’ve been in wastepaper, and it’s my love story. For thirty-five years I’ve been compacting wastepaper and books, smearing myself with letters until I’ve come to look like my encyclopedias — and a good three tons of them I’ve compacted over the years. I am a jug filled with water both magic and plain; I have only to learn over and a stream of beautiful thoughts flows out of me. Hanta’s absolute devotion to his work makes his visit to a new Socialist-run wastepaper compacting business utterly shocking. Here, instead of lovingly observing every book that comes through the machine and rescuing them when possible, the workers are perfectly efficient; not a movement or thought is wasted, and it doesn’t occur to any of the workers to care about a book. The workers there are turned into machines themselves, no more than extensions of the hydraulic press they operate. Hanta knows that his days are numbered; his method of working carefully, lovingly, and, yes, slowly, has never pleased his boss or made him a success, but now it might disappear entirely. By the end of the novel, Hrabal made me care very much about this strange man so devoted to his work, but even more so to books and the pleasure and wisdom they bring.